Normal is not the same as average. That’s a theme we’ll revisit time and again over the next five minutes. We’ll start by breaking down two years in the life of a rental property and look at how a normal month looks very different from the monthly average. In rental management and in life, money doesn’t flow regularly like a tranquil creek. Rather, it moves along steadily for a while, then a storm of expenses hits and it’s thrown radically off course. Then the storm subsides, and the creek slips back to its normal flow. We’ll use rental cash flow for visualization, but then we’ll tie these lessons back to personal finance and household budgeting. Stick with us even if you’re not a landlord, because we’ll be illustrating a larger point about budgeting and how money flows. After all, who can’t use a little bump in their budget? Congratulations! You own a rental property. Your property (let’s call it Treehorn for fun) rents for $1,000/month. That means in a quiet, “normal” month, your expenses are $450 for the mortgage and $80 for management. 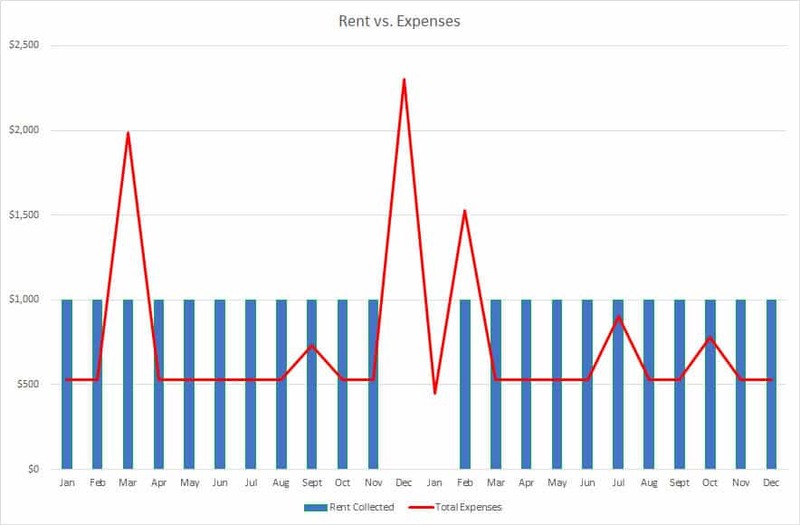 For the “I hate math” crowd, that’s $470 in cash flow on a normal month, which is all fine and dandy, until occasional-but-very-real expenses rear up and start breathing fire at you. There are plenty of quiet months. But there are plenty of months with extra expenses, too. What’s the difference between “normal” and “average”? In a “normal” month, your cash flow is $470. But averaged over time, your cash flow comes to $179.46/month—and that’s the important number. In our example here (which is based on a real property of mine), Treehorn’s roof needed a major repair in March of Year 1, which set you back $1,458. Later that year, you coughed up $200 for Treehorn’s furnace to be serviced in September. Then, at the end of November, the tenants gave you notice that they were moving out. In December, you sent in a painting crew, who repainted the inside of the unit to the tune of $1,850. Making matters worse, Treehorn spent two lonely months vacant as you marketed it for rent. By mid-January, your property manager found a new renter, who moved in on February 1st. Kiss goodbye a one-month fee for placing the new tenant. When added to the regular 8 percent of February’s rent, you were left with property management and labor expenses of $1,080 for February. Treehorn then performed for you for a little while, until a repair bill of $375 slapped you in July. October brought a maintenance bill of $250 to fix an ailing thingamajig. You closed out Year 2 quietly. And for that, we thank Treehorn. Whether you think these repair and maintenance costs were high or not (I don’t think they were), they pale in comparison to the turnover costs. I harp on this all the time to our online students: turnovers are a landlord’s worst enemy. Consider the example above: the turnover cost $2,000 in lost rent, $1,850 in repainting (which only needs to be done during turnovers), and $1,000 in labor to place a new tenant. That’s almost $5,000 in costs caused by one stupid little turnover! By contrast, the maintenance and repairs costs above totaled $2,283. And at the very least, the property was materially younger and in better shape for those costs. The same can’t be said of the turnover expenses. Even the paintjob is effectively lost money – the new tenants will leave their marks on those walls, which will probably need to be repainted again come the next turnover. When most landlords want to improve their cash flow, the first thing they jump to is raising the rent. And sure, that improves cash flow in a “normal” month. But I’ve found that the best way to improve my real cash flow, my long-term average profit, is by doing everything possible to cut my turnover rate. As a final thought for landlords, imagine you prioritized tenant retention and reducing turnovers. Instead of Treehorn turning over every two years, it turns over every four. When you chop those turnover costs in half, the average monthly cashflow surges from $179.46 to $277.17. Not a bad bump in profits, right? And you’re still reading? That’s amazing. By now, it should be clear that cash flow is about averaging out the peaks and valleys of irregular expenses. Experienced landlords know this, and new landlords need to learn it fast to succeed. But how is this lesson relevant in our personal cash flow and budgeting? It’s relevant because the same thing happens in our personal budgets, just not as obviously. You may not have to budget for turnovers, but you have other irregular costs. Homeowners have to budget for property repairs just like landlords do. Cars also need maintenance and repairs, just like houses. All of us have occasional medical bills, large and small (one might call these our own personal maintenance and repairs costs). I bet if you added up every penny that you spent on gifts over the past 12 months, you’d be shocked at the total. (Seriously – between holiday shopping, birthdays, weddings, showers, and other arbitrary occasions when we’re supposed to buy people presents, most of us spend an undocumented fortune.) It’s these irregular – but very real – expenses that throw the proverbial wrench in our budgets. Then next month you get hit with an unexpected $500 medical bill. The month after that it’s an $800 car repair. If you’re a landlord, you (hopefully) have an expense checking account set up for each property. You put money into it every month, based on your average monthly cash flow calculations for expenses like repairs, maintenance, vacancies, etc. The lesson for all of us is to do the same with our irregular personal expenses. Set up a special account with the sole purpose of covering irregular personal expenses: gifts, unexpected medical bills, car repairs, and so on. How much you put toward it is a personal decision, but if the account ever gets below $200, you’ll know you need to be putting more into it. At the end of the year, if you have extra money in the account, good for you! You can shift some of it to an investment account for real estate, stocks, notes, whatever. You know these expenses are coming. You’re an intelligent adult. Now budget for them, so you’ll never be surprised again when irregular expenses pop up and make a grab for your wallet! How do you handle irregular expenses? Any tips or tricks you’d care to share? Don’t be shy! Post them below! Thanks for the article. 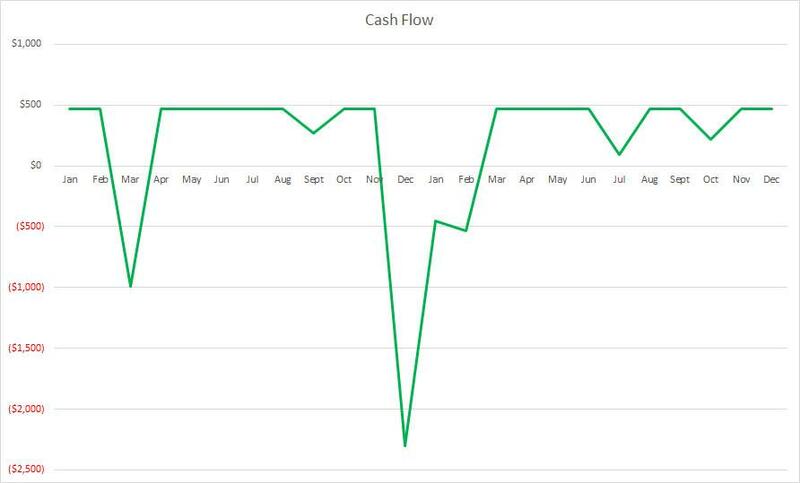 I confess I didn’t look at cash flow this way but from now on I will. Very good article and great graphics! Excellent…talking about ‘boring’ numbers in a new and very interesting way. Awesome. Thanks Tim, trying to keep things fresh and interesting! Good post Brian. It is so commonplace for investors to ignore the true costs of a real estate rental, just because they don’t write a check for them, regularly. 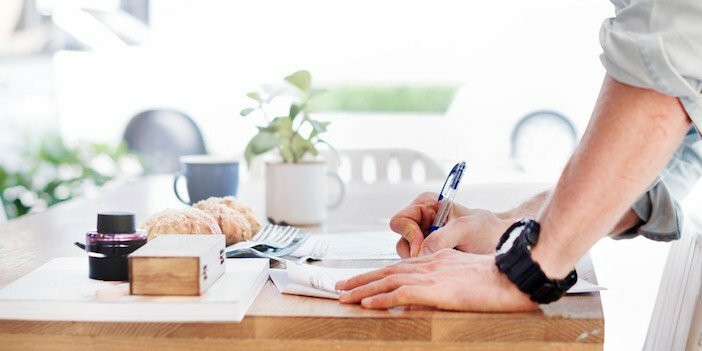 Recognizing infrequent expenses, regularly, via allowances is the only rational way to keep them on the radar, especially when analyzing a potential deal. Your examples and graphs made this point in a unique way. Also, the point about turnover being a primary focus for expense reduction is genius! It aligns perfectly with what we as landlords actually are, which is service providers. And our renters are our customers! Not enemies to be avoided or paid no mind to. I give my cell phone to all of my tenants, even though I hire pro management. I treat them all like people, with respect, and I believe the relationship that permits and engenders goes a LONG way in tenant cooperation, loyalty and retention. Good job! Thanks Rob, and I totally agree, establishing a human connection with your renters goes a long way in retaining them, which is the name of the game in rental management. Excellent article, especially for the calculator challenged like myself! Seriously, well thought out, clear, well written, and the graphs visualize it perfectly. Thank you for your hard work and willingness to enlighten us Sensei! Glad it was helpful for you Douglas! Thanks for the article. There was a time that I did not take into account those irregular expenses. Before I learned more about investing I came up with a program I still use. Initially I tried to set aside a few thousand for covering repairs. When buying a property I would always build in $50 to $75 into the cash flow costs for maintenance. After I had a fair number of rentals I increased mt reserve to $5,000. Since I have about $2K set aside from rental income every month I am able to pay for almost every repair from cash flow over the average of my properties income. The $5K is a cushion for a really bad month, like a $7K sewer line replacement that goes out into a paved street for almost $8K. I have several credit cards with large lines of credit and a zero balance as a backup safety as well. I am also very proactive about fixing things before they become a problem. When roofs show wear you put them in a rotation for a new roof. I keep an extra water heater in the warehouse so even if I get several expenses I can save $400 or $500 there. Same with refrigerators, toilets and faucets. Having some on hand can help you out in really bad cash flow month. 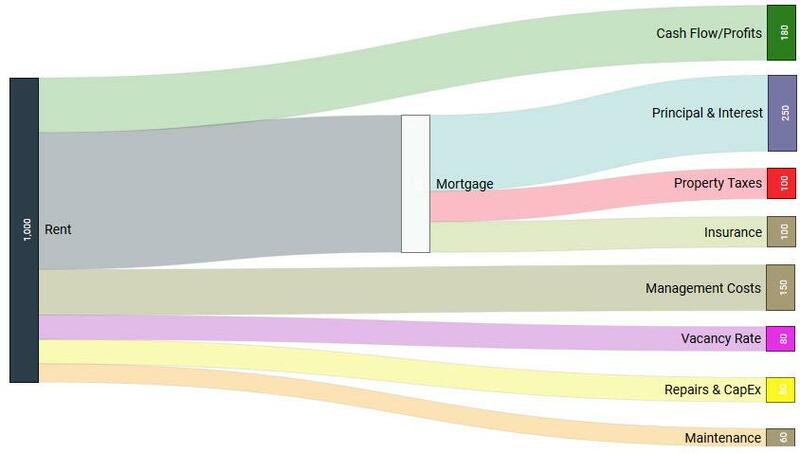 My single biggest problem is having the extra $5K in the bank then seeing a place for sale and using my reserve as the down payment on buying another property. It then takes 6 to 8 months or even longer to build that cushion back up again. I do not pay myself out of my company, I roll everything back into it to accelerate the growth. In the near future I plan on switching to paying off loans to increase cash flow for retirement. I hear ya about the temptation to use your cash reserve for a down payment on a new property! But it sounds like you’ve gotten a good sense of your properties’ expenses and needs. Thanks for taking the time to comment! @Jerrry W. – I agree with your approach to spreading risk across the investment portfolio. This was you don’t tie up a large amount of cash for each property. How long did it take to determine that $5k was the magic number? Wow Brian, what timing. Yesterday I was discussing with a newbie (non-believer) about not underestimating expenses and the need for establishing a good reserve. Now you provide another excellent point for my side. I keep telling him and others to not go with minimum amounts just to make the numbers look better. It’s much better to save more than you need and have it available than not have it and all of a sudden you need it. Besides, it’s still your Money. Thanks for continuing to provide excellent guidance. Thanks John! 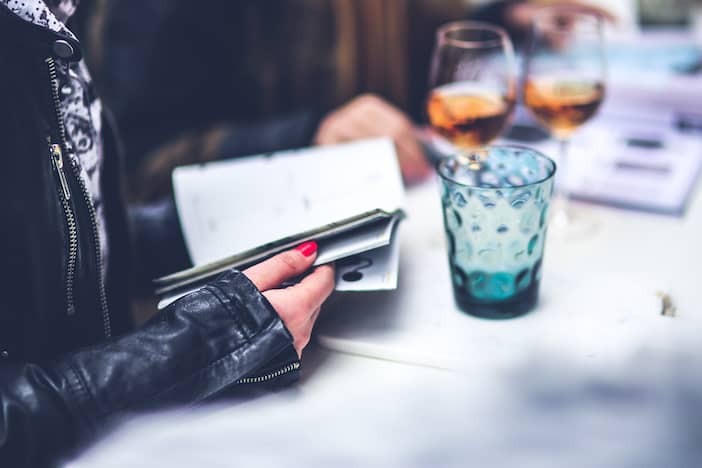 And you’re absolutely right – it’s tempting to use attractive numbers, but reality has a way of slapping you if you don’t take these expenses seriously! – the simple thing to do is allow about 33% of the rent for operating expenses = everything but the mortgage P +!. So multiply the monthly rent times 8 not twelve = 800 to pay the mortgage P+I , the taxes and insurance are included in the 33% operating expenses. This guideline assume the landlord does not pay any utilities nor use a property manager; works well long term. The irregular nature of repairs and vacancies also leads to the concept of a reserve fund. I encourage my students to have about 2500 to cover maintenance and another 2500 or so to cover a turnover for the first 4 or so rentals (20,000 or so) . After reserves for 4 or so units, the chance of multiple simultaneous turnovers / repairs is small so the 20,000 max is adequate. As far as the actual cash flow, given today’s interest rates the mortgage will take 4.9% of the cap rate, leaving the rest for cash flow ..this is true for any cap rate and any price property. – second, buying gifts for family and friends is not an unexpected expense; it is mostly “budgetable.” My wife and I long ago added up all the bdays, anniversaries, Mother and Father’s day, Christmas gifts, etc and divided by twelve and put that amount in our budget. A great shorthand way of thinking about expenses Steve. Thanks for sharing! Great article. I am setting myself up to purchase a 3rd investment property. My debt-to-income is too high. Because of this, I am paying down my debt first before I set aside funds for the unexpected. I am paying extra, on my debt, using multiple incomes that I receive. This has been a monthly amount anywhere from $2000-$5000. ($5000 is getting money back from those that owed me money.) If I have an unexpected expense, I just won’t pay as much ‘extra’ on my debt for that month; and I’ll have the cash to pay for that unexpected expense. By next month, I would have paid off a $32,000 debt. This took me 13 months. I now have a credit score of 805. This picture looks very good, but I am 67 years old & still have a HELOC of $78,000 & mortgages on 2 properties. 805 is a helluva credit score Peggy! You should be proud. And great job paying down so much debt so quickly! Best of luck with your third investment property, keep me posted! Brian – Great article on the perspective of what an investor should consider ‘profit’. Using this approach we can create an effective pro-forma to determine if the rental income can cover the fixed and variable expenses. Thanks Colin! I’m convinced that accurate cash flow forecasting is the key to success in rental investing. Brian, Good Article and very timely as we are going over our expenses and are fine-tuning our income. I like to keep things simple and your article was presently quite clearly and simply. Love the graphics also. Those graphics in the article are so basic yet very eye catching in demonstrating truth and hard reality. The article stated “Budget for the irregular”. In other words, have a reserve account. In the investing world a well known radio host calls it the bucket system. This article proves, once again, why the land lording business can be like a revolving door. It takes money to make money and one turnover gone bad can lead to financial disaster – and that’s with a good tenant. Don’t forget that tenants who trash your asset and disappear like a pro magician can make it difficult, if not impossible, to ever collect or recover those damages. Speaking of “It takes money to make money”, most Americans have about $8-10k in credit card debt and not enough savings to cover even three months of unemployment. Some of these same people jump into the real estate game head first with NO reserve funds at all expecting smooth sailing that some real estate seminar promised. Thanks Chris! Yeah being a landlord requires a significant cash reserve, and setting aside cash flow every month. It’s a lesson I had to learn the hard way! Thanks for the comment Marilyn! Do you have a template of advice on how to set up a spread sheet for the type of graph you use here so we could get that visual on our own rentals?